1. All qualified ticket holder attending at Sofitel’s Spiral New Years Eve Celebration on December 31, 2018 in Spiral (6pm-9pm) are entitled to join the raffle draw. 2. 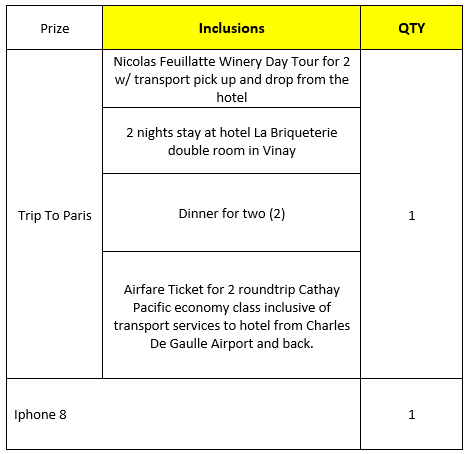 Qualified ticket holder for the raffle draw are entitled to win the following prizes. 3. To enter the raffle, qualified guests must simply fill out a raffle stub and drop it in the raffle draw tambiolo ( raffle drum) displayed at the reception area of Spiral. The details to be filled out are as follows: Name, Complete Mailing Address, Contact Number and Email. 4. Tickets will be available on December 19, 2018 at the lobby of Sofitel Philippine Plaza. One (1) valid ticket is counted as one (1) raffle entry only. Deadline for submission of raffle stubs is on December 31, 2018 at 9:00pm. 5. The tambiolo shall be closed on December 31, 2018 at 9:05 pm after the deadline of dropping of entries. A DTI representative will be invited to be present during the drawing of winners. 6. On December 31, 2018 at 10:15 pm, The host shall draw the winners. 7. The draw will be held in Spiral staircase with the presence of a DTI representative. 8. The winner will be announced on December 31, 2018 at Spiral staircase. Winning tickets will be subjected to validation before awarding the Prize. 9. The winner must be physically present and must present his/her valid ID. Sofitel has the right to validate the identification of the winner. 10. Winner will be notified via e-mail for the claim of the prize and awarded a certificate on the raffle date. 11. The winner may claim the prize at Sofitel Philippine Plaza Manila and must present one (1) valid government ID and printed notice of winning (e-mail) to the F&B office, Sofitel Philippine Plaza from 10am to 6pm, Monday to Friday. 12. Unclaimed prize after 60 days from receipt of notification will be forfeited in favor of Sofitel Philippine Plaza Manila with prior approval from DTI. 13. Sofitel Philippine Plaza Manila shall pay 20% tax for prizes exceeding Php100,000.00. 14. Winner shall pay the expenses of Schengen Visa and Airport fees and taxes, and insurance. 15. Employees of Sofitel Philippine Plaza Manila including their relatives up to second degree of consanguinity or affinity are disqualified from joining the promotion. 16. Per DTI-FTEB Permit #16362, Series of 2018. 1. The raffle is open to Philippine Residents only. Disqualified Participants may not enter in the raffle. 2. Sofitel Philippine Plaza reserves the right to exclude any person from participating in the Promotion on reasonable grounds (such as fraudulent,” disqualified participants”). 3. Sofitel Philippine Plaza reserves the right to refuse to award any prize to an entrant who Sofitel decides (in its sole discretion) has violated the Rules, gained unfair advantage in participating in the Promotion or won using fraudulent means. 4. 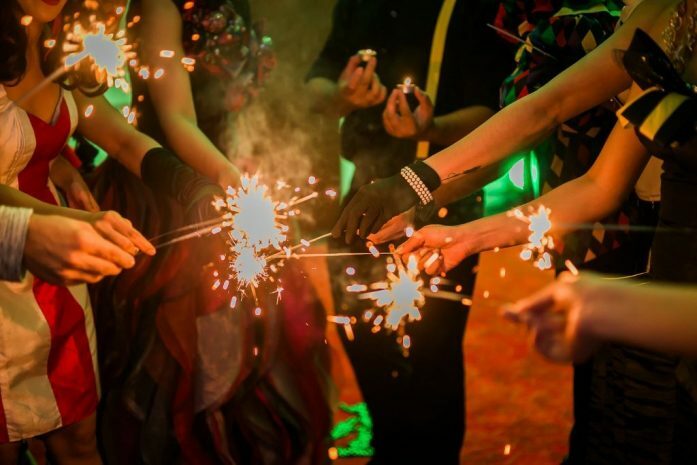 By participating, entrants grant Sofitel exclusive permission to use their names, characters, photographs, videos, voices and likeness in connection with the Promotion and for future promotion and marketing purposes and waive any claims to royalty, right or remuneration for such use. 5. All entrant personal details must be valid and up to date and will be held by Sofitel and may be used for the purpose of the Promotion and for future promotion and marketing. 6. The Winner will be determined in the manner set out in the Promo Mechanics. 7. The prize is not redeemable for cash. 8. Where the Winner is required to claim the prize in person, they must provide proper identification (eg driver’s license, passport, birth certificate). If the Winner is under the age of 18 years their parent or legal guardian must accompany the Winner or ensure an adult will accompany to the award of the prize. 9. The Winner takes the prize entirely at his/her own risk and indemnifies Sofitel in respect of any claim for any accident, injury, property damage or loss of life that may occur in connection with the prize. The Winner is responsible for all insurance, tax or other costs that may be associated with the prize. i. Any fines, penalties, payments or expenditures incurred as a result of such documents not meeting the requirements of those authorities (including any costs associated with delay, will be the sole responsibility of the Winner). (i)The winner has to use the prize by 30th of December 2019. Block out dates may apply. 11. Sofitel Philippine Plaza reserves the right to amend, vary, extend or discontinue a Promotion at any stage, for any reason such as Act of God, legal issues, man-made disasters, etc..
12. To the fullest extent permitted by law Sofitel will not be liable for any loss or damage whatsoever (including but not limited to direct or consequential loss) or for personal injury as a result of Promotion entry or winning the prize. 13. Participation in the Promotion is deemed acceptance of these Terms and Conditions. 14. If the Winner does not accept these Terms and Conditions the prize will be forfeited.